It’s easy enough for a shaped data-only plan. Divide monthly fee in cents by monthly MB, and there’s the required figure. But what if the plan bundles unlimited local calls with internet access? Under the unit pricing rules, are you allowed to attribute part of the plan fee to calls and calculate cents per MB for data based on the remainder of the monthly charge? And may you reduce the DSL cost base even more by attributing half of line rental to voice calls as well? If you can use a lower DSL cost base, what’s the right basis for determining what % of the monthly charge to attribute to the included local calls? If you do advertise cents per MB based on a cost apportionment, does your ad need to state what the breakdown of the monthly fee is? The ‘No’ case is that Unit Pricing is intended to be a straightforward mechanical calculation, without distortion arising from apportioning parts of monthly cost to different service components. On this view, if you pay $100 and you get 100MB, the unit cost is a buck a megabyte. It doesn’t matter that the plan also includes a stack of phone calls. They aren’t part of the calculation. And if we allow service providers to carve up their price for the purpose of calculating cents per MB, who will audit their figures? The ‘Yes’ case is that unless you apportion, you’re giving the wrong answer. You must be, since you’re calculating as if unlimited local calls are worthless. It would mean that a $100 25GB plan without any calls can quote the same unit price as a $100 25GB plan that includes all local calls. And even if the call component is supposed to be ignored under the unit pricing rules, how can it make sense to load 100% of the included line rental into the DSL cost base when you can’t make the included phone calls without a line? Maybe this kind of plan isn’t even a ‘post-paid internet plan with included value’ at all. 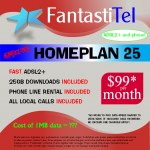 Since the Code doesn’t expressly deal with plans like the FantastiTel HomePlan 25 with its combo of data and local calls, maybe we’re meant to assume they aren’t covered by the unit pricing rules. A grocery retailer is not required to display a unit price for a grocery item that is a bundle of different grocery items offered for sale for a single price. [Standardised pricing rates] … in advertisements … may also require the development of new product constructs that over time will reconcile with a simpler pricing regime. For instance, disclosing the volume of units to be included in a plan will place pressure on industry to remove flagfall costs. 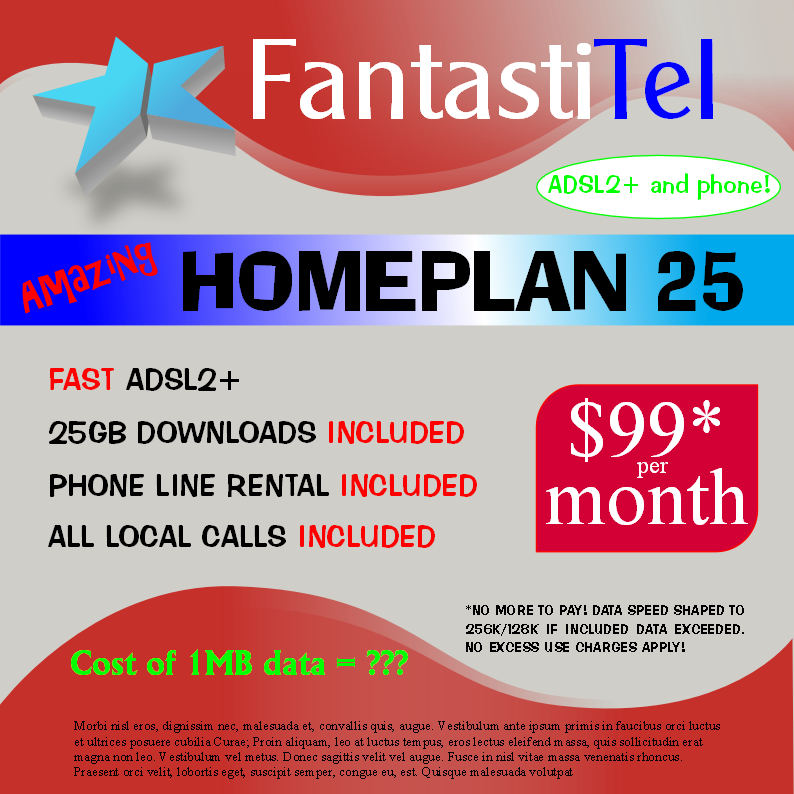 Maybe bundled data and voice plans like the FantastiTel HomePlan 25 are too complex for consumers to compare in the market without confusion. Perhaps they are covered by the unit pricing rules, and if telcos don’t like the way ads then look, they’ll have to move to simpler product ‘constructs’. the cost of using one megabyte of data within Australia, provided that if the above usage is unlimited, the Supplier is not required to quote a cost for the data usage that is unlimited in the Text Advertising. Maybe this operates to exclude all shaped data plans from the unit pricing rules, since there is no MB limit on the customer’s downloads. You can’t advertise a shaped plan as ‘unlimited’, at least without very clearly explaining the effects that speed shaping will have on the use of the service, but we’re not talking about using the word ‘unlimited’ in any advertisement here. We’re talking about whether the fact that the plan does not have any fixed MB limit means that it has ‘unlimited’ data usage for the purposes of working out if the unit pricing rules apply to it. The cost of downloading 1MB of data under this plan is 0.1 cent for the first 25GB and 0 cents per MB after that, but at the shaped speed. That could be a solution for a shaped data-only plan but it doesn’t answer any of the questions we asked about data plans that bundle line rental and local calls. If telcos were selling groceries, they wouldn’t face this uncertainty. The grocery regulations answer the question in black & white: bundles aren’t covered by unit price requirements. 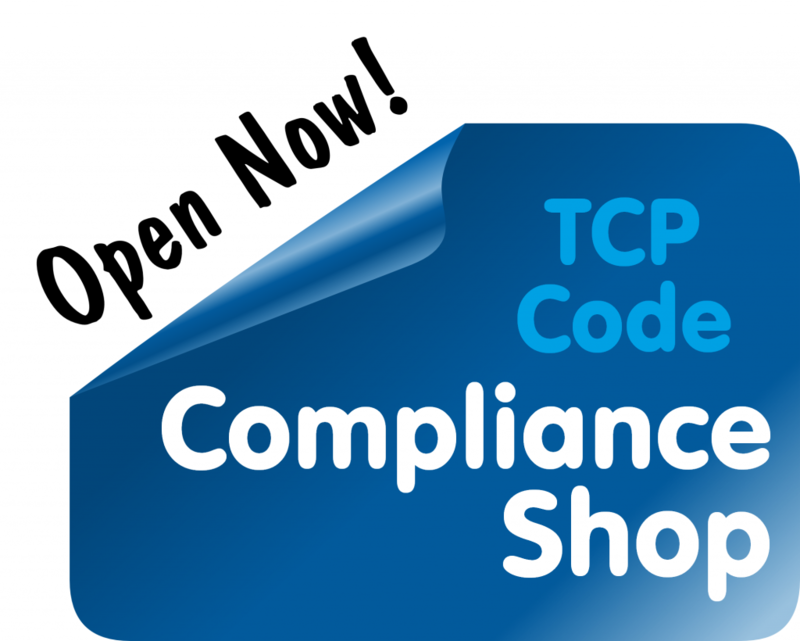 The 2007 version of the TCP Code was accompanied by 87 pages of ‘Guidelines’ that were not binding but cast light on what the Code drafters had in mind. We’re not advocating a return to the days of a separate explanatory volume but some regulator guidance would be a welcome aid to implementing the 2012 Code. As things stand, it’s not always easy to know what’s the right thing to do. Until we get some clarification, telcos that offer more complex fixed line plans and bundles than are described by the words ‘post-paid internet access with included data’ need to do their best to address the Code’s requirements in good faith. This entry was posted in Advertising, Criticising the Code, Unit Pricing Rules and tagged unit pricing. Bookmark the permalink.